Discover how WWI transformed America through the stories of African-American soldiers, feminist activists, Native-American “code talkers” and others whose participation in the war to “make the world safe for democracy” has been largely forgotten. At the outbreak of the First World War three cousins reigned over Europe’s greatest powers – Tsar Nicholas II of Russia, Kaiser Wilhelm II of Germany and King George V of England. This 2-part series looks at the role played by the three monarchs, and their relationships with each other, in the outbreak of war, arguing that it is far greater than historians have traditionally believed. This one hour documentary, narrated by Robert Llewellyn, follows a fourteen-year personal journey of determination and skill rebuilding history, beginning with the discovery of various aviation artefacts belonging to Captain F. D. H. Bremner, a World War One pilot. Chanced upon by his grandsons, the find leads to them to undertake a rebuild of the Bristol Scout aircraft flown by their grandfather during the Great War. The programme follows David & Rick Bremner along with their friend, Theo Willford in their ambitious task of building the aircraft, one of the first single seat fighters, to its original specifications, searching out the original plans and parts list, using former techniques and construction skills, learning, as they do so, the trials, tribulations and triumphs that faced those early pioneers of flight and aerial warfare. Above the trenches of the Western Front, another battle is taking place. From the stumbling, earliest days of flight to the savagery of industrialised warfare, the aeroplane has become a killing machine. This moving documentary shows the violent and savagery experiences shared between Australian and Japanese soldiers forged in the dense jungles of Papua New Guinea. The Kokoda Campaign was a war without mercy, the scene of one of the most brutal conflicts in Australian History. This 2-hour special shows the story of men caught in the war and how they reconcile their shared history over sixty years later by interviews with Australian soldiers and for the first time show extensive interviews with Japanese soldiers and airmen to gain a unique and almost lost perspective of the Kokoda Campaign. The battle was a decisive Australian victory, a victory that delivered Australia from Japanese encirclement and possible occupation. The film provides Australian and Japanese audiences with poignant statements about the bloody nature of war and how this has scarred the young men who fought it. Mata Hari is the very epitome of beauty and feminine seduction. As a courtesan she captivates the most influential men of her time, and she exerts a hold over our imagination to this very day. But as World War I raged did Mata Hari really betray secrets revealed to her by her influential lovers? Was she a German spy? Was the death sentence passed by the French justified? This documentary tracks down the true Mata Hari – the most famous and most beautiful spy of all time. For a century, the United States of America and Australia have fought side by side in every major conflict. It’s one of the longest alliances in modern history. The relationship hasn’t always been easy or even. Both countries have changed dramatically since 1918 when they first fought together at Hamel, France in World War 1. The scale of US power has transformed the world. But this friendship, forged in battle, shaped also by long exchanges of ideas, people and trade, is a fascinating story of trust, difference, loyalty and respect: what Australians would call mateship. Mateship – Australia & USA: A Century Together is told via the present tense journey of renowned journalist Mike Munro through key places and periods in the history of the US-Australian relationship. Mike encounters places, objects and people that bring the past to life. 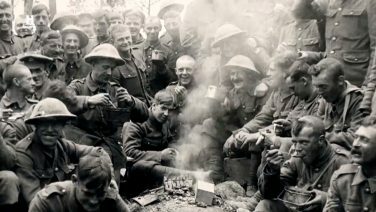 The film also draws on the rich moving and still archives of Australians and Americans at war and at peace. At Messines in Belgium, bomb disposal specialists work alongside archaeologists on WW1s biggest archaeological dig. During the First World War this was one of the killing fields of the Western Front and 100 years later the ground is still littered with unexploded shells, grenades and ammunition. Held by the British in 1914, Messines was captured by German troops, including a young Adolf Hitler, and for nearly three years the two opponents faced each other in trenches, which the archaeologists uncover. What are revealed are trenches, which have seen the results of some very heavy fighting. 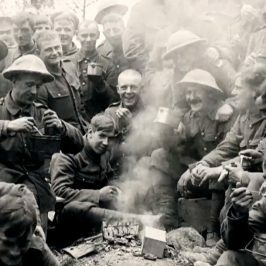 Tony Robinson tells the powerful and moving story of five men of one battalion as they enlist, train for and take part in the worst disaster in the history of the British army. This landmark centennial tribute marks the 100th anniversary of the WWI Battle of Beersheba – one of history’s last successful cavalry charges, mounted by the romantic Australian Light Horsemen against the Turkish enemy in Palestine. The film features unique interviews with Australian veterans, such as Gunner Len Hall, who not only helped capture Beersheba, but also landed at Gallipoli with the Anzacs and rode with the legendary Lawrence of Arabia to capture Damascus. When the passenger liner Lusitania was torpedoed by a German U-boat off the southern coast of Ireland in 1915, the ship sunk in just 18 minutes, taking 1200 people down with it. The needless tragedy arguably altered the course of World War I, as the number of Americans among the dead pulled the previously unaligned US and all its military might into the war. Focusing on eight individual passengers and the German U-boat captain, this enthralling film brings those desperate last 18 minutes onboard the Lusitania vividly to life. From the kitchens deep below deck to the first class cabins, it reveals stories of heroism, sacrifice, luck and misfortune and how these individuals’ fight for survival impacted on the lives of millions world-wide. The period 1915-1918 was the darkest hour in the life of Winston Churchill. Disgraced by the Gallipoli disasters, he fell from the Admiralty and political power, and was subjected to a whole series of political humiliations. He was “finished”. His wife feared he would die of grief. This was his greatest test. He was also tormented because he knew he was one of the very few political leaders opposed to the dreadful one note strategy of endless attrition in Flanders which was chewing up a whole generation on barbed wire. His invention of the tank and promotion of air power (as well as Gallipoli) stemmed from his determination to find another strategic way; but how could he help save the nation if he was disgraced and exiled from power? All his virtues were seen as vices. This is the story of his fall and the road to redemption.